While we’re overloaded by celebrity tales, we need more of this kind of autobiography from those who created programmes and of course created the BBC’s reputation as the country’s foremost cultural institution. 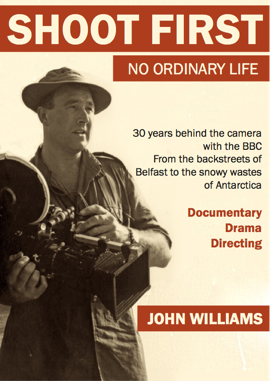 Williams insights into the nature of regional and national production, the personalities and roles, the (literal) nuts, bolts and decision making of making TV in the post-war era adds an invaluable resources for the understanding the social history of modern Britain which, if anything is bound up in the story of TV and the stories it has told. What has emerged is something more than that. It is a small piece of history written with the passion and involvement that only someone so committed can do. Others have said “The book is a rollicking good read”, “boys adventure stories ( adult boys )”. “the book is illustrated on every page ; a coffee table book ,one to share with family at Christmas”. For those of us from Pebble Mill this is an adventure story with a difference because many of you will know of these adventures and some of you will surely be familiar with the characters involved . There are, so many memories! The Book is A4, 216 pages full colour , 96,500 words and I’m selling them first come first served at cost £14 plus postage or can be collected.